We are kind of obsessed with limes. With so many tasty recipes, how can we not be a little head over heels for the fruit that can add a little zing and zest to our food and cocktails? The high acid content and tartness make limes a powerful cooking ingredient. Enhance cocktails, decadent desserts, and a rich meat dish with a squeeze of lime or a sprinkling of lime zest. The most widely used limes in the United States are Bearss limes. These limes feature a thin green rind, so they are super easy to squeeze and apply for a variety of recipes. Below are some delicious ways to use limes. How do you like to use them? Marinate a Whole Chicken. Use lime zest as a key ingredient for marinating whole chicken. We love to create a flavorful paste using them in the food processor with scallions, ginger, salt, and oil. Click here for a recipe from Martha Stewart. Make a Lime Glazed Shrimp. Make a spicy glaze for broiled shrimp skewers. This recipe calls for lime zest and juice, honey, garlic, red-pepper flakes, oil, and salt. Make Lime Cilantro Rice. This easy recipe includes using lime zest, lime juice, and cilantro. Stir the mixture into the cooked rice just before serving and enjoy! Make Lime Chicken Soft Tacos. Taco Tuesday just got a whole lot tastier! We like to create a lime chicken mixture using vinegar, lime juice, sugar, salt, pepper, green onion, garlic and oregano and serve it with chicken over a warm tortilla. Add to Hibiscus Tea. Make your tea even more refreshing adding honey and lime juice to freshly brewed hibiscus tea. Chile Lime Peanuts. Turn the heat up on your favorite cocktail companion, peanuts! Toss peanuts with fresh lime zest, Thai chilies, butter, sugar, and salt. Make Margarita Cupcakes. Spice and spike cupcakes with lime zest, juice, and a tequila-spiked curd filling. These cupcakes are guaranteed to be a hit at your next Taco Tuesday or Cinco de Mayo party! Click here for a recipe from Martha Stewart! Key Lime Pie. A favorite on both coasts, we can make an easy key lime pie. Combine egg yolks, sweetened condensed milk, lime juice and mix! Frozen Margaritas. It is not a frozen margarita without limes! A frosty margarita can keep you cool during the dog days of summer. Grab a bunch of limes and squeeze to make fresh lime juice. You will need tequila, sugar, and lots of ice to blend into a tasty cocktail concoction. Top it off with a lime slice and enjoy. Spring Lime Tea Cookies. No tea party is complete without cookies. These light and soft, buttery cookies are bursting with citrus flavor! Click here for a recipe! Buy a Tree at Fruit Producing Age and Enjoy Limes Today! The best way to enjoy the juiciest limes busting with citrus flavor is to buy a tree at fruit producing age. 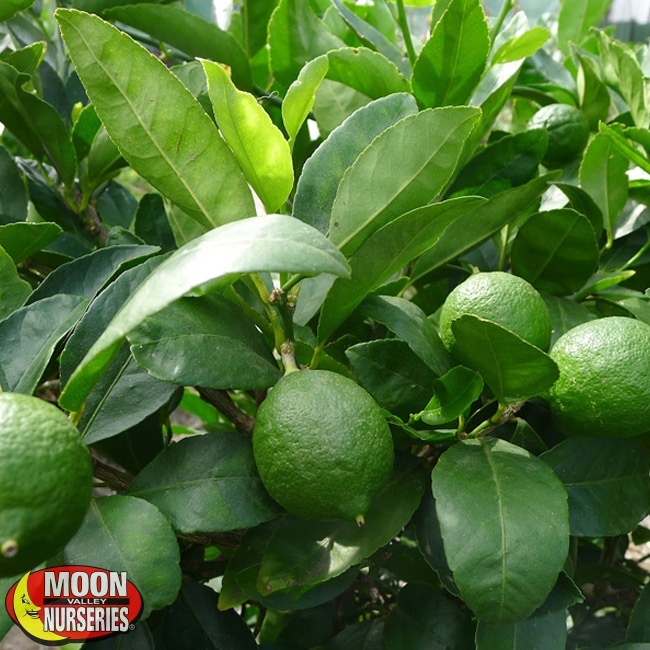 At Moon Valley Nurseries, we sell lime trees with fruit so that you can try your hand at making any of the recipes listed above!